As many in our food allergy community know, AUVI-Q auto-injectors made their highly-anticipated return to the epinephrine market on February 14. As part of this return, parent company, kaleo, make a huge splash by offering a number of opportunities to acquire a set of AUVI-Q for $0. In fact, it seems that the majority of auto-injector patients will fit the criteria for this free offer! Of course, not every aspect of the AUVI-Q return has been perfect – most importantly in my mind that these pocket-sized auto-injectors are not readily available in the nation’s major pharmacies. However, kaleo made plans to get around that via a direct-to-consumer delivery program (which also cuts a lot of healthcare system costs out of the process). The result of this return of AUVI-Q to the market has been tremendous demand, significantly greater than kaleo imagined – so much so that there is now a 4-6 week delay for most patients to receive a set of 2. This delay is expected to be one-time in nature – in other words, by early May, kaleo expects there to be no further delay in receiving AUVI-Q ordered directly from them. The bottom line is that demand for AUVI-Q is booming and management is being as expeditious as possible to satisfy that demand. Short-term stumbles like this shouldn’t be terribly surprising given the uncertainties of a major re-launch such as this, combined with the changing landscape of the epinephrine auto-injector market. I feel it only fair to point out that there have been other criticisms of kaleo on social media that are similarly reasonable mistakes from a re-launch, such as people receiving a bill in their package (that shouldn’t happen and should NOT be paid, according to my kaleo contact) or packages being received cold (I confess that mine was a little chilly), and other criticisms that go beyond what I would consider temporary, such as insurance saying they won’t cover AUVI-Q (call 877-30-AUVIQ, as you should still be able to receive free sets) and patients having to call kaleo to receive each new set of AUVI-Q, even if multiples are prescribed and ordered at once. That all said, I can’t help but be impressed by the incredible level of demand for the re-launched AUVI-Q. It seems that not only are prior patients willing to forgive past mistakes (that led to a full AUVI-Q recall), but in actuality even more patients are seeking to make AUVI-Q their go-to auto-injector. A result of Mylan’s (maker of Epi-Pen) missteps with the community? Fallout from CVS and others switching Epi-Pen prescriptions to generics? kaleo’s $0 offer for AUVI-Q that covers a majority of the food allergy community? Probably all of the above. So let’s hope that kaleo resolves these short-term issues as planned and can begin satisfying all hopeful customers. Before I publish the letter from kaleo’s CEO below, let me ask you to please share your thoughts on the AUVI-Q re-launch and this post in the Comments section. And while I’ve got your attention, remember to click over to the Find Restaurants section of AllergyEats and rate any restaurant experiences you’ve had recently. Each new restaurant rating helps the entire food allergy and intolerance community! As a company founded by patients with life-threatening allergies, kaleo is grateful for the overwhelming support we have received for AUVI-Q Auto-injector since the product recently returned to the market. Interest in AUVI-Q by patients and healthcare providers has far surpassed all expectations. The exceptionally high demand for AUVI-Q has resulted in some patients experiencing short-term delays in receiving their prescriptions. To meet the ongoing needs of the community, we took immediate actions by doubling the staff at our call center, temporarily limiting prescriptions to one carton per patient, and implementing a process with guidance from physicians whereby patients who have no epinephrine auto-injector options at home received AUVI-Q first. Most importantly, we have ramped up manufacturing to meet the high demand for AUVI-Q. While we have sufficient manufacturing capacity to supply the entire epinephrine auto-injector market for the United States, there will be a temporary delay in AUVI-Q shipments until we catch up on the inventory demands. While these measures are being implemented, we believe current production will not be able to address the near-term demand for AUVI-Q. This will result in some patients experiencing delays in receiving AUVI-Q of up to four to six weeks between now and May. This is not a capacity-related inconvenience but rather due to production timing as we build sufficient inventory to clear all backorders and fill new prescriptions. We apologize for the inconvenience this will cause you and your family during this period and appreciate your patience as we work through this temporary situation. You can, and should, continue to enroll in the AUVI-Q Direct Delivery Program. You will be contacted the same day a prescription is submitted, and in most cases, without 2 hours of the pharmacy network receiving the prescription. Delivery of AUVI-Q will be scheduled for the first available shipment, and may be delayed up to 4-6 weeks, between now and May, until the temporary production delays are resolved. You are encouraged to ensure there are enough epinephrine auto-injectors on-hand that have not expired until AUVI-Q can arrive and should work with your healthcare provider on alternative options accordingly. You, your physician or any family member can call our toll-free hotline, 1-877-30-AUVIQ, for updates on your AUVI-Q prescription or to answer questions about how to schedule the delivery date that best suits your needs. If you have any questions for kaleo, please do not hesitate to contact us. We sincerely apologize for the inconvenience during this period of overwhelming demand for AUVI-Q. We are taking every possible step to continue ramping up production and appreciate your understanding during this temporary period. I am ok with waiting for more, as long as I truly will be able to receive it when it’s back in stock; I was told different stories by different reps. One broke my heart when she said my insurance is not going to cover it, so I was only eligible for the roll out, complementary set. Another rep said I should be able to get it regardless of my insurance. An alternative to the Epi Pen is supremely important to me. I have 3 children (boys) with multiple allergies and now that my oldest is 14, it’s becoming increasingly difficult for him to find ways to carry 2 Epi Pens with him at all times. He’s a stylish kid who prefers his jeans skinny! My #1 reason for supporting Auvi Q, is the size. #2 is absolutely the ease of injection. I feel much more comfortable doing it myself, my kids feel more comfortable, and their care takers (teachers, coaches, friends’ parents, etc. ), are more confident with Auvi Q. I should add, I have always been able to get the Epi Pen with a zero co pay, so cost is not my issue with Epi; it’s everything else! First of all we are so thrilled that the Auvi-Q is back on the market. I love that they are addressing the shortage issues head on. Hopefully once things settle down the $5000 (?) price tag (without their free offer) will come down to a reasonable price as well. We have a 10 year old who is comfortable with the epipen so just refilled our epipens for this next year. I encourage others to do so as well. I am so excited for the Auvi-q to be back in our home and school and intend to get them as soon as reasonable. But I personally think it’s important for young adults and teens to have access to them first. They are a high risk group because they tend not to carry epipens because they are bulky and awkward to put in a pocket. So I agree with kaleo decision to limit the first prescription to one 2 pack. The blind community has gone crazy with excitement that this is back!! Thank you very much we appreciate it. 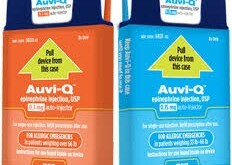 When the Auvi-Q was recalled it was being marketed by Sanofi. Kaleo (after regaining the rights to the product) built a state-of-the-art, automated facility to manufacture the auto-injector, thereby aiming to minimize risk. The Auvi-Q is not just an auto-injector with a different form factor; Kaleo’s unique innovations (voice commands and retractable needles) actually makes this a safer product. The direct mail fulfillment allows Kaleo to bypass the traditional pharma supply chain (with distributors, pharmacy benefit managers, and others taking a cut). In my opinion, this is a brilliant strategy! Yes, no discussion of the $4,500 price tag in this “article” – actually it should be marked “advertising.” This exorbitant price makes the epi-pen at $600 look inexpensive! Will Mylan raise the price of Epi-pens since Kaleo is charging way more? Will the $4,500 price tag blow up your insurance plan resulting in higher premiums down the line? Just another greedy Pharma company making outsize profits from life-threatening food allergies. We loved our Auvi-Qs before the recall, so I dropped off forms at the allergist’s office the day before the re-launch since our EpiPens were due to expire at the end of February. I got Auvi-Qs for both kids by the date promised by the rep I talked to on the phone, and they were perfectly packaged. We have a $12,000 deductible, so I really appreciated the zero out of pocket price. No complaints here! I’m just sorry that people are now having to wait. Reading the other comments…I talked to an actuary in the insurance industry and asked her whether the insurance companies were being made to pay toward the $4500 retail price, and she said most likely no. She said that often drug manufacturers slash prices direct to consumers, and in this case, they slashed the price to zero for most. Who knows how much the Auvi-Q will cost us when it’s time to refill, but I’m crossing that bridge when I come to it. For now, we carry Auvi-Qs because we love the size and voice instructions. How am I supposed to transfer my previous Rx from Walgreens? Do I have to go get a new Rx from the doctor and submit that to the auvi-Q? This is a huge hassle not being able to obtain my Rx from local pharmacies…too many hoops! As someone who’s insurance stopped covering epi-pens or even generics (even when my huge deducible has been met), I’m thrilled to see an insurance company looking out for patients and accessibility of products. Epi-pens and coverage has gotten to the point where my allergist with life threatening allergies went without because she couldn’t afford it (my jaw dropped when she told me this). When I found out about this program I almost cried as the epi-pens I’d been holding onto since 2016 just expired. I’m sure insurance companies who agree to cover this product don’t actually pay 4,500 as alternative pricing is pretty typical for them, and I like their model to redistribute insurance payments to help those who can’t afford auto-injectors with this very inclusive program. I feel like a lot of times us fortunate enough to have insurance with insurance get excluded help programs even if we have deductibles. Ultimately, I hope that if this program doesn’t work initially they’ll find different ways to make this program work. Side note about the actual product: I was always teased for the appearance of my epi-pens (they resemble something that’s very easy for girls to get picked on for owning.) There was a long period of time where I refused to carry epi-pens because of this teasing. It was also so hard to go anywhere without a purse or backpack because of the sheer length of epi-pens. I REALLY look forward to having something more compact and easier for strangers to use. I have a friend who asks me for a lesson on my epi-pen EVERY time we go out just in case something happens. I really hope this product and program is successful, and have already shared what I’ve learned about it with others who have allergies like mine.